After decades of uncertainty, the Apollo 16 S-IVB impact site on the lunar surface has been identified. S-IVBs were portions of the Saturn V rockets that brought astronauts to the moon. 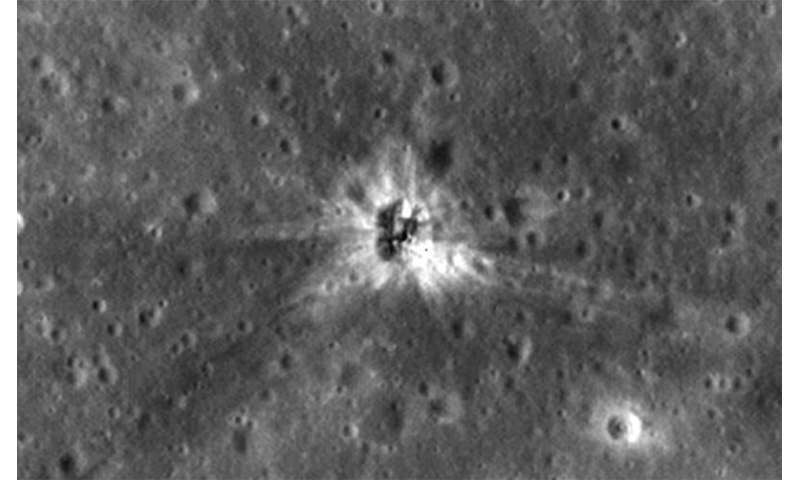 The site was identified in imagery from the high-resolution LROC Narrow Angle Camera aboard NASA's Lunar Reconnaissance Orbiter. Beginning with Apollo 13, the S-IVB rocket stages were deliberately impacted on the lunar surface after they were used. Seismometers placed on the moon by earlier Apollo astronauts measured the energy of these impacts to shed light on the internal lunar structure. Locations of the craters that the boosters left behind were estimated from tracking data collected just prior to the impacts. Apollo 16's S-IVB stage is on Mare Insularum, about 160 miles southwest of Copernicus Crater (more precisely: 1.921 degrees north, 335.377 degrees east, minus 1,104 meters elevation). Looks like there's a bit of the stage still in one piece. Would be interesting to take a closer look. I down loaded the pic so I could zoom in. To me it appears badly mangled but still in one piece. It would take a higher resolution pic to be definitive. All those Apollo conspiracy theorists are going to be infuriated by this. Can't wait to see the fallout. We've got to build a museum around it for the first moon tourists. Imagine how cool that will be for kids in the 27th century on field trips. I bet aliens would like to see it too if there's ever any interstellar tourism. The impact was at 5800 mph, so any visible pieces are likely only in your imagination. That depends. The empty stage was basically a hollow thin walled tank with some low-pressure gas inside. It either acted like an airbag, or, burst into trillion pieces. No. The velocity of shear waves in aluminum is roughly 3200-3300 m/s, longitudinal waves 6400 m/s or 14,000 mph. Even if there was a shock wave traveling faster than the longitudinal speed, the far side of the booster would be essentially unaware that the first side had contacted. It takes very roughly 400,000 J to melt a kg of aluminum but each kg arrived with 6,760,000 J, so that first side would have melted and partially vaporized, along with a large amount of lunar regolith. The trivial amount of gas inside would not have time to escape from the sides, and would instead get compressed and heated. The far side of the tank would almost immediately impact with the same overwhelming energy, leading to an explosion from within a self-made hole in the lunar surface. I'm not sure why you think any part would survive.